I could not figure a way to just respawn stuff for a side only when it owned the nearby sector, sure people write very long scripts for this with multiple files and folders in the mission folder but they are almost always for missions, not multiplayer scenarios. Peirremgi doesn't really like the modules (he writes those very long scripts usually) but he wrote this to make it work like I wanted. So if you ever see him over at the BIS studio forums tell him I made damn sure to credit him for this. You can still read this but go down a few post to get the new less complicated way of doing this. You can change the variable name. Do not link to vehicles if you want then to respawn only with the trigger activated. All linked vehicles will respawn automatically. You can choose your options in module. Name them or identify them with all you want but you need an array of vehicles to be respawned (remember: they are not linked to module) . I named the trigger modulelogic1, the variable name he used above, it works without that but if you have multiple of these setups then they'd have to be named different I am sure. The vehicles DO have to be synced to the trigger. Else you drive outside the trigger and it get killed and it won't respawn. In the on activation field of trigger. He and I now disagree about something but I think its because of language difference or something. He says it should work even if the vehicles are not synced to the trigger, I think he he thinks I'm syncing them to the veh rsp module. That would not work right. You can still change all that stuff, delay, number of respawns, in the vehicle respawn module. I think he took some of that code from one of his other scripts. The vehicles/planes/tanks have to have variable names because of the array or something. No longer need to link the vehicles in the new way or name them all. That picture shows the vehicles inside the area of the trigger but the trigger can be one of those without an area. Just tried on the scenario I'm doing and it works perfect. Just make damn sure you name the vehicles and that that name is in the code for that particular respawn combo of module and trigger. Nothing like spending 20 minutes wonder why it didn't work then remembering you didn't name the vehicles in that group. Really this was all I needed to make the scenarios I wanted to make all along. I have spent a long damn time trying to make something like this work. LOL the vehicle explosions were funny when they'd spawn over/on each other over and over. I thought I almost had it when that happened. It is the damnedest things that will mess it up, respawnOnStart = 1; <-without that in the init.sqf the repair script won't work and I don't know what else won't work without it, all I know is someone told me to use that in the init, who I don't remember. Last edited by Bailing_Out; 11-22-2017 at 02:04 AM. 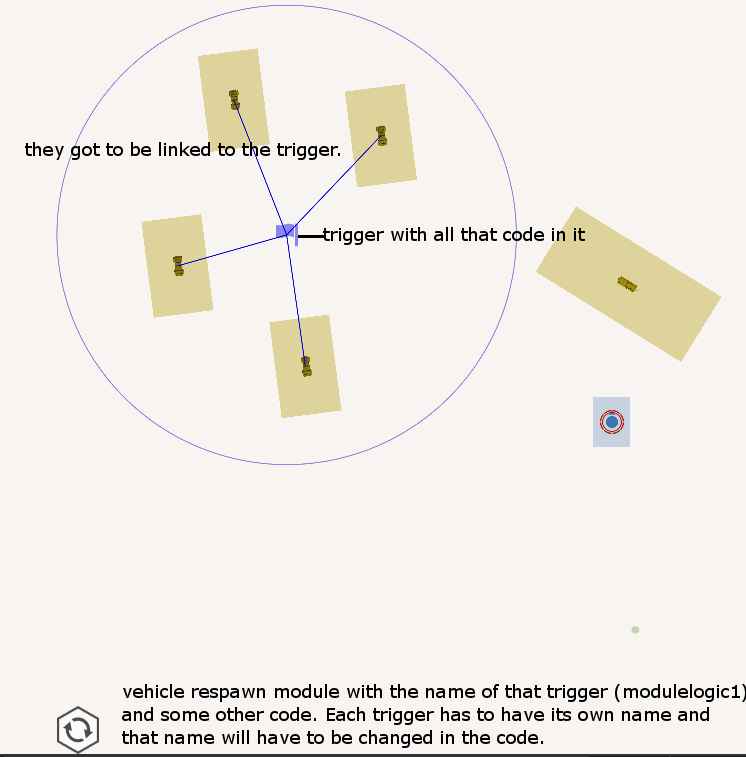 Ok so apparently Pierremgi writes even better than he knows, while you do have to changed the name of each trigger you use with the vehicle respawn module, and change the name of the trigger inside the vehicle respawn module itself YOU DO NOT HAVE TO NAME EACH VEHICLE if you do it like this. That way their stuff will only respawn if they have the sector. with the name modulelogic1 as its variable name. FOR THE LOVE OF ALL THAT IS HOLY DO NOT FORGET TO GIVE A TRIGGER OR MODULE A VARI8ABLE NAME IF THAT NAME IS GOING TO BE USED BY ANOTHER MODULE OR ANYTHING ELSE!!! All I changed was, forEach [car1,car2,car3,car4]; to foreach thislist; No more naming the vehicles, no more linking the vehicle to the trigger. Whatever is in the area of that trigger at round start will respawn until either the round ends or till it uses the tickets you give them in the vehicle respawn module. Found out that any vehicle you lose while not having the sector will no longer respawn after you gain it back. Makes keeping the sector with the most valuable vehicles very important. If you want vehicles to keep respawning after a side has lost and regained a sector then the first way, where you name the vehicles works. The "thislist" version works but any vehicles killed while the sector they spawn at belongs to the other side, they will no longer respawn.